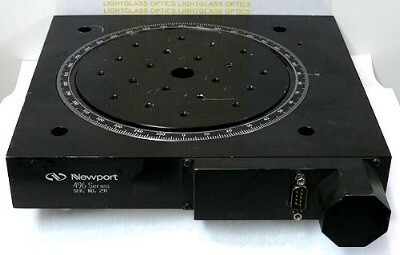 The Newport 496A Rotation Stage has a removeable insert with a 6 inch clear aperture. I will include the insert with this stage. I have tested the motors on these and they turn freely. The 496 has been replaced by Newports RV240 series of motorized stages, which now cost between $4000 and $6000 each, depending on how you option them out. The rotation elements on these stages run on precision ball-bearings and the stepper motor drive uses a precision worm gear for driving the stage.